The “no parking at any time” sign is clear and incontrovertible. Nearly the whole of Williams Road is laid out like this – three traffic lanes – one in each direction, and a centre bidirectional turn only lane – with a bike lane next to the curb. 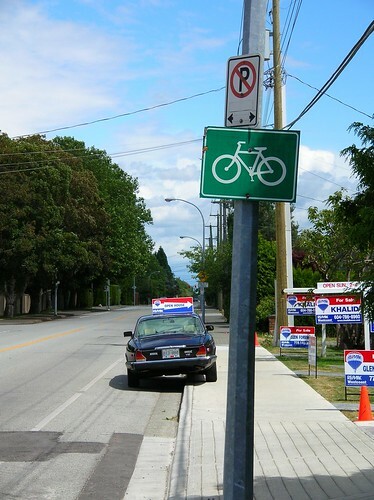 Parking is not allowed in the bike lane. It is also not allowed on the sidewalk. You can look that up in the Traffic by law. Once upon a time in my career I was involved with parking policy issues – which included the thorny question of parking enforcement. In Central London in the early eighties, parking regulation enforcement declined as the police insisted that any increase in manpower (we still called it that in those days) go to police officers and not traffic wardens. By 1984 chaos ensued. Even the tickets that were issued were not collected as the courts simply did not have the time to hear cases. Britain’s licensing system was such that it was not possible to refuse someone car insurance for unpaid parking fines. Indeed, the legal system itself regarded “fixed penalty notices” simply as an alternative to court action – they were not actually “fines”in law. The Transport Road Research Laboratory had looked at the use of the wheel clamp in places like Denver. There, when you had more than ten unpaid tickets, your car was clamped by the authorities, and not released until the fines were paid. An early version of a handheld computer (a Psion I think) was used to track the tickets. This did not appeal to our Minister – who feared a backlash from the civil liberties lobby – but he suggested clamping for any parking infraction. The trial of the clamp was far more successful than anyone predicted. All law depends on a level of compliance. Most people obey posted signs most of the time. But every so often they will try a “contravention” – and hope they can get away with it. Unfortunately after a while this tends to expand. The more they “get away” with something, the more they will do it. The clamp was the method we used to get back to a tolerable level of compliance. Because you cannot have a warden – or a police officer – everywhere, all the time. Stephen , thanks for the photo shot. As a fellow cyclist , I can appreciate your concern and took care to neither block the bike nor the pedestrian access. It ain’t pretty but for 2 short hours , I’m just trying to do my job and be a good citizen. I observed and photographed an incident today where a realtor had parked partially on a sidewalk and partially on a bike lane. The location on the south side of Williams, west of No 2 Road is clearly signed “No Parking at any time”. 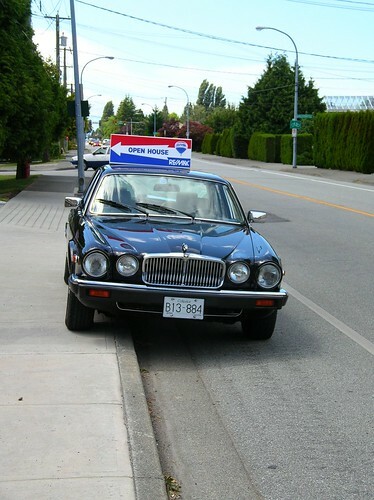 The vehicle was being used as a static advert for an open house, and the advertising is also clearly visible. Please note that City of Richmond Parking Enforcement staff are unable to issue parking tickets unless the incident is witnessed first-hand. However, if you forward you concern to the RCMP, they may be able to pursue the matter further. Should you have any further questions or concerns, please feel free to contact me. And I got a very similar response from the RCMP. Apparently you can’t send them email – but you can call them. And if I printed off the whole lot I could go down to the police station and lodge a formal complaint. It is curious that you can, for instance, take a picture and email it to the CBC evening news and it will be on that day’s broadcast. I have done that quite a bit with weather pictures. You can send email to your MP or the Prime Minister. But not the Mounties. Glen Foreman was not being a “good citizen”. He was trying to sell a house using a method that forced cyclists into a traffic lane – and anyone on the sidewalk – with a sight impairment for example – would have been inconvenienced. 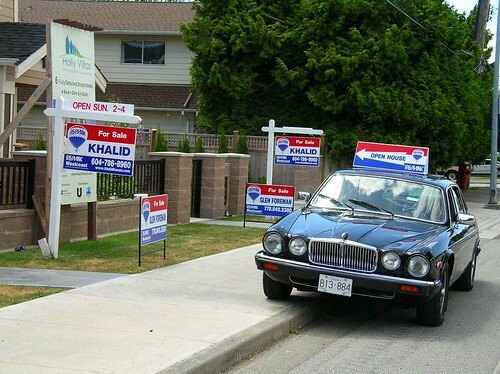 He could easily have put up signs showing an open house without having to park a car to put the sign on its roof. Indeed he did! And he did contravene more than one bylaw. When people break the law and there are no consequences, compliance shrinks. It seems to me that Glen does not acknowledge any wrongdoing or express any remorse. I think he should. Possibly by using social media – like flickr, this blog and twitter – I will create some pressure on him – and his agency – to reconsider this practice. I hope so. After all, the amount of money he makes – since he can afford a collector car Jaguar as well as his work vehicle – a paltry parking ticket will not make much of a dent. Although people do get more enraged by parking tickets than almost any other penalty – and will try to fight them. Indeed I have – and have succeeded – but felt disappointed that the issuing officer did not come to court to fight his side. And in case you agree with Glen that he was not blocking the bike lane take a look at this. Not that it matters. He was breaking the law. Even if he doesn’t get a ticket, maybe he can get some public discomfort. Nice Jag. Shame about the driver. « What’s stopping the bamboo bike from shooting into the mainstream? Actually Stephen, it appears that you witnessed two. The car blocking the lane, that apparently belongs to the realtor, is insured as a collector vehicle. Vehicles with collector plates can be used for pleasure only, and unlike the pleasure class for everyone else, those with collector plates are not allowed occasional use for driving to work or school. I would assume that an open house would be work for the realtor. I wonder if ICBC takes info by email. On another note, much like Bob Rennie, parking tickets, or other infractions are just a cost of doing business. ~45$ is small price for advertising, especially if you only get caught 10% of the time. A couple of months ago I ran into a situation with a Canada Post truck that was blocking the bike lane here in Victoria and got a similar response from the Canada Post person. He basically said it was “safer for the drivers” to temporarily block the lane vs. pulling onto one of the sidestreets. I don’t think the photos uploaded/linked properly – I can’t see them. Same thing here in Edmonton. Parking Enforcement seems completely unable to do their jobs and when you make it EASY for them and hand them enough information to actually ticket, their web of restrictions and rules handicap their ability to uphold the bylaws. Quick case in point. The same car would park for HOURS on end in the loading zone (5 min max.) in front of my building on a regular basis. I happened to be standing there and the car was there when the parking enforcement officer came by. I had a chat with him about the history and asked him to ticket it. Two hours later I looked out. Car still there. No officer, no ticket, the car stayed there the rest of the afternoon…. I checked the post – with a different browser – and it seems ok to me. However, flickr has been slow to respond recently, so it may have been a problem at that end. [Reader] , thank you for your follow-up , upon reflection I would agree that my parking was not appropriate and I have no plans to replicate , in future. You’d think someone with a collector car like that would be worried about it getting sideswiped (and scratched) by a bike trying to squeeze by in the tiny bit of bike lane he left them. Just sayin.